Supporting our veterans at the Service Academy Career Conference. Supporting our veterans at the Service Academy Career Co nference. 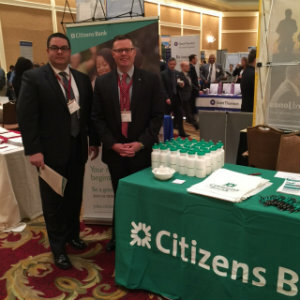 Each year, Citizens Bank heads to the Service Academy Career Conference (SACC), a job fair held exclusively for service academy alumni. It is a unique opportunity for veterans to come together to engage with a large number of companies from all industries. For Citizens, it is a chance to meet candidates with some of the most valuable, transferrable skills—leadership, teamwork and responsibility. Citizens Bank recruiters and leaders from various business lines connect with over 700 alumni of the U.S. Air Force, Coast Guard, Merchant Marine, Military and Naval academies at SACC. Candidates meet with Citizens representatives, who offer advice on how to enhance a resume, evaluate a candidate’s skillset and share information about career paths and life at Citizens. Over 30 onsite interviews were scheduled with veteran attendees this year. One highlight from this year’s conference was a web presentation held a couple days before the conference by former Army Special Forces veteran and Citizens colleague John, EVP in Consumer Banking who works in Everyday Banking. It was a chance for service academy alumni to hear the Citizens story right from the mouth of a veteran—someone who has been in their shoes before. Three new veteran hires resulted from SACC this year: Caroline, who served in the Coast Guard and is now a branch manager; Charlie, a navy veteran, now a senior internal auditor in Corporate Banking and Operations; and Doug, who served in the navy and now works as a Data Analyst in HR Talent Management. Caroline: Put yourself out there and do NOT downplay your experience and your accomplishments in the military. Even if your time in the military seems routine, you must realize that your experience gives you a unique perspective. You have translatable skills, you are important and you are hirable, so be confident and embrace it! Charlie: There are a ton of military veterans who really want to help and there are multiple networks out there with folks who are willing to advise you and guide you along the way. Some resources that have helped me are LinkedIn, ISABRD (a service academy resource) and veteran networking groups. Embrace your military network to help you grow both your knowledge and your contacts. Doug: I would recommend veterans check out the Travis Manion Foundation. Named after Travis Manion, a Marine who was killed in action in 2007, the foundation is a nonprofit organization that provides transition assistance and opportunities for veterans as they head into the workforce. They have workshops and seminars across the country that I found really helpful and a great network of veterans who can relate with one another. Also, LinkedIn offers a 1 year free premium subscription for all veterans through linkedinforgood for veterans which connects veterans to employers. I would highly recommend any veteran looking for opportunities to leverage these free resources. Learn more about life at citizens and our supportive culture committed to embracing colleagues from all backgrounds and experiences.